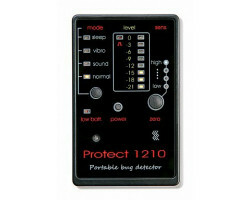 The Protect 1210 is the ultimite in covert dectection device its slim card style designs is packed with professional features. Created for continous protection, body worn appliaction. 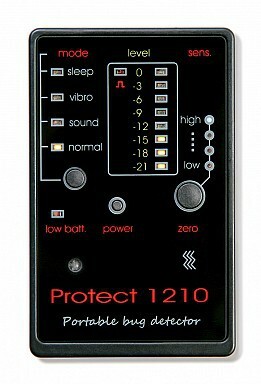 This unit has 4 different detect modes. Search – is a silent mode. Sound – will produce sound when transmission is detected. Vibro – will vibrate when motion is detected. Sleep – the unit will wake up every 3 seconds to check the environment. If there is an increased level of transmission an alarm will sound and the unit will stay active as long as the transmission is present. The zero feature is when you are “zeroing” in on a device press the zero button and the display will clear out and only show when the signal become stronger. Frequency range 50MHz – 3GHz.